The recent Baltimore riots highlighted the plight of inner city — mostly African American — residents of Baltimore. A good way to understand the issues at hand is to map the spatial distribution of housing, and in particular vacancies. In the glorious days of post-war Baltimore (population peaked there at around 950,000 residents in 1950), demand for housing in the city center was outstripping the actual supply of housing units. But the city’s population has shrunk by about 37% in 60 years, and there are vast amounts of unoccupied housing in the city center. An interactive map of neighborhoods (a.k.a as census tracts in geographers’ parlance) can be found on my website here. I present in this map the fraction of vacant housing units in each neighborhood, together with the number of housing units in each neighborhood. The map presents the distribution of vacancies for the entire metropolitan area. The rectangular boundaries of the city — much smaller than the metro area, which includes Baltimore’s suburbs — clearly delineate urban blight. For instance, Rosedale, Maryland is a small community right to the East of Baltimore city. Interestingly, Rosedale is a more than 70% white and middle-class suburb, which sits right next to inner-city neighborhoods where a fifth to a quarter of all houses are vacant. Telework is ten years old. In its short time its capacity for redrawing the geographical and organisational boundaries of the traditional, centralised entreprise has been amply demonstrated. The positive consequences: […] new employment opportunities for various categories of workers, potentially without geographical limits. The dream was that we could work from anywhere: congested roads during the morning commute would be a thing of the past as we could simply stay at home; or move to an inexpensive countryside house with a pool and a garden — all we need is an internet connection. We would avoid the long flight across continents to meet face-to-face or discuss contracts. Conference calls and visioconference would wipe out jetlag fatigue and impersonal hotel stays. Of course that vision didn’t come through. Technology has made face-to-face communication more important, not less. Online communication is much more likely with somebody living in the same metro area than with somebody living in another urban cluster. Wannabe IT entrepreneurs still need to meet their Venture Capitalists face-to-face: would Marc Andreessen endow a new entrepreneur that he hasn’t met in person? The whole premise of the Silicon Valley is that people want to live close to other people with the same interest. In a recent paper titled ‘Does Distance Matter in Banking?’, Kenneth Brevoort and John Wolken show that most banking relationships remain local, with a median distance between lender and SME of 5 miles. More significantly perhaps, such distance has actually decreased in the early 2000s. Distance matters. The world’s cities are as important as ever as families are ready to pay large sums of rental money to live in crowded apartments rather than in less crowded rural or semi-rural houses. Close to 55% of the world’s population now lives in urban areas. The world is not flat. 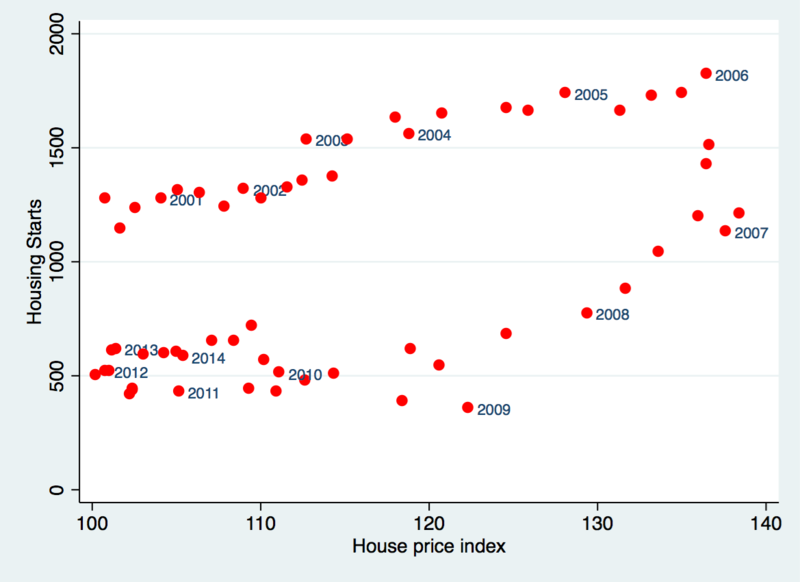 Sounds like house prices are back to their 2005 level, right? 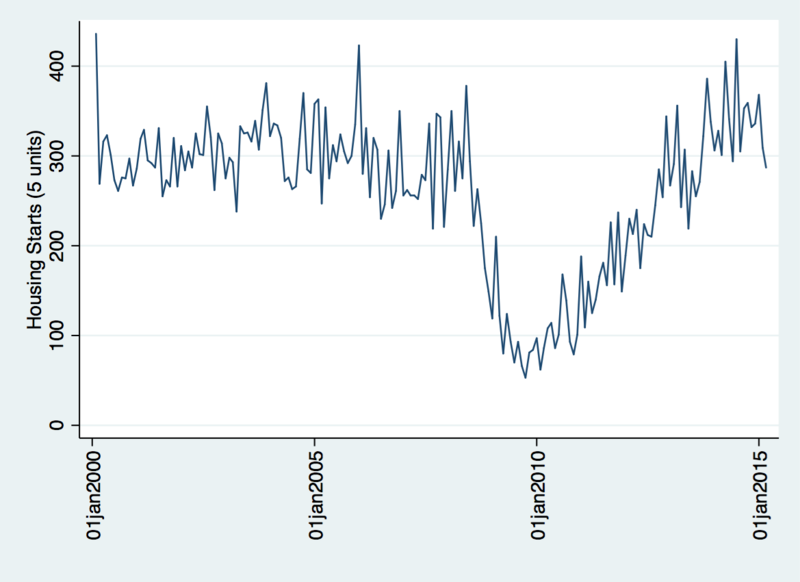 Except that much of the increase is driven by nominal, not real increases. Deflating house prices by the Consumer Price Index reveals a slightly different graph. 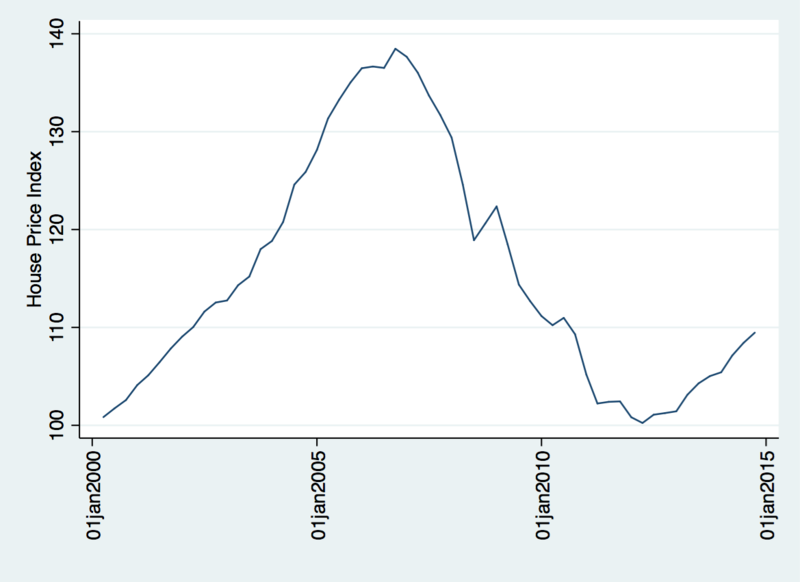 In real (rather than nominal) house prices have only slightly climbed above their 2002 levels. 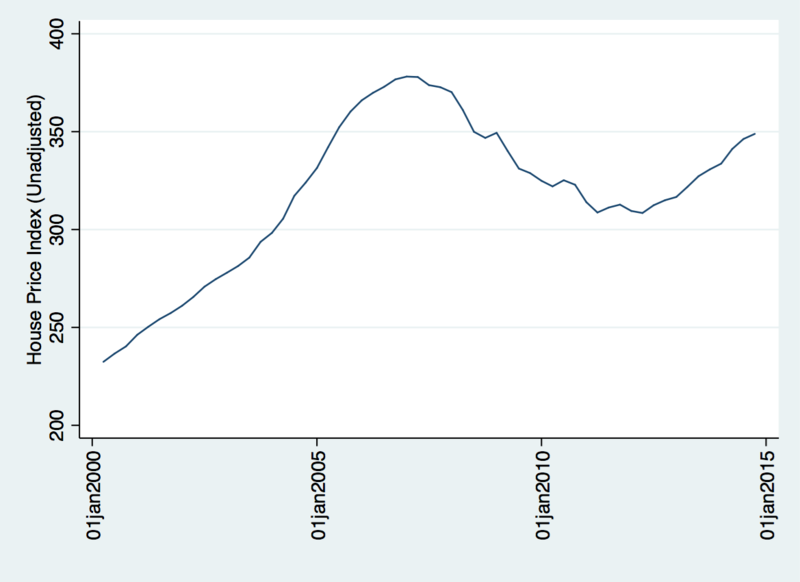 That’s a much smaller increase, but still reveals that there is an imbalance in the demand and supply of housing units. Housing starts are more than 35% below the 1500 level. There is a tight connection between population and housing demand. The construction of new homes is not keeping up with the demand pressure. What’s new in 2015 is that the supply of new homes is not keeping up with demand. 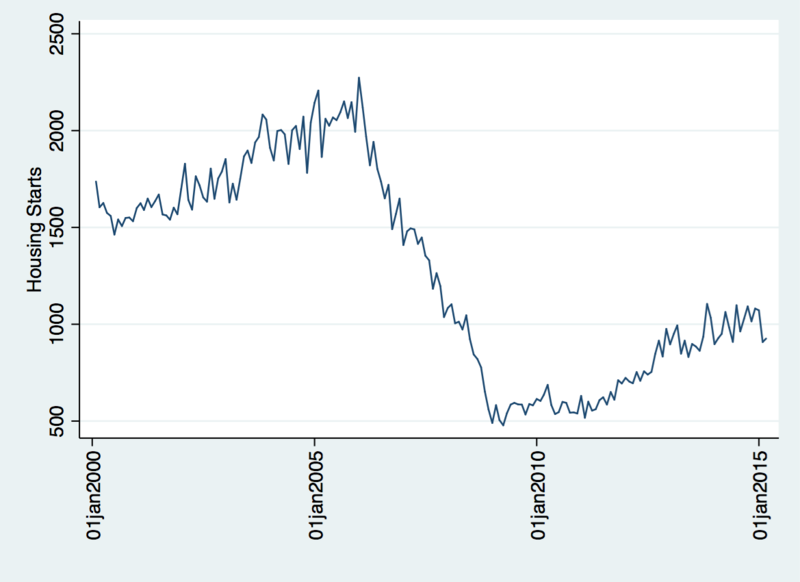 As the graph below suggests, since 2007 we seem to have entered an area of low construction. One interesting thing: there is a large increase in the construction of new multi-unit structures. A look at construction starts for 5-Unit Structures or More reveals a much different pattern; the U.S. construction industry is back at building dense, urban dwellings. The Economist reports on the growing housing crisis in London. And on the urban “regeneration” projects that push low- or middle-income tenants out of central London. Link here. The Global Urbanist argues in favor of lifting the London Green Belt’s building restrictions. But rather than building on the Green Belt, what about building taller in London? The Guardian argues that taller buildings (e.g. in Canary Wharf) have not prevented rising transaction prices… but these are commercial buildings, not residential developments. The Lincoln Institute of Land Policy has a data set and a paper detailing land cover for a range of cities. They did good work on estimating the amount of land taken by those cities. we found that average density in the built-up areas of a global sample of 120 cities declined at a mean annual rate of 2.0 percent between 1990 and 2000. Land is more and more inefficiently used. In particular, “urban land cover in Sub Saharan African will increase more than 12-fold between 2000 and 2050.” So in fact as population grows the amount of land per capita increases over time.